Etoile de Mer Villa offers high vaulted ceilings and tile floors throughout that keep the house cool even on the hottest days. You can open the glass doors in the living areas, and the trade winds will carry the sounds and aromas of the sea right in your living space. Spend your days encamped by the pool where you can swim to the edge and look directly down over the beach below, or grab a book and snuggle into one of the comfortable lounges on the covered terrace. Etoile de Mer is a fully air-conditioned beachfront property located in Shore Pointe, which is a gated community sitting on Cupecoy Beach. This 4-bedroom villa is a hideaway for those seeking a combination of comfort and convenience; only a 3-minute drive separates you from leisure, dining, and gaming, yet 24-hour surveillance provides for a private experience. Can be rented as a 2-,3-, or 4 bedroom villa. Shore Pointe at Cupecoy has been developed into a jewel. In fact, the various homes have been named for the ‘jewel tones’ of the Caribbean. The site is directly on the Caribbean Sea that displays shades of blues and aquas. Guests will appreciate the floor plans and views. All rooms open to covered and open terraces on the sea. As guests enter these open-floor-planned rooms and look out to the pool, it is difficult to discern where the pool ends and the Caribbean begins. Sixteen villas reinvent the standard of refined living and vacationing. Each villa has clean lines, generous proportions, and open-plan living areas that stay true to the Caribbean way of life. 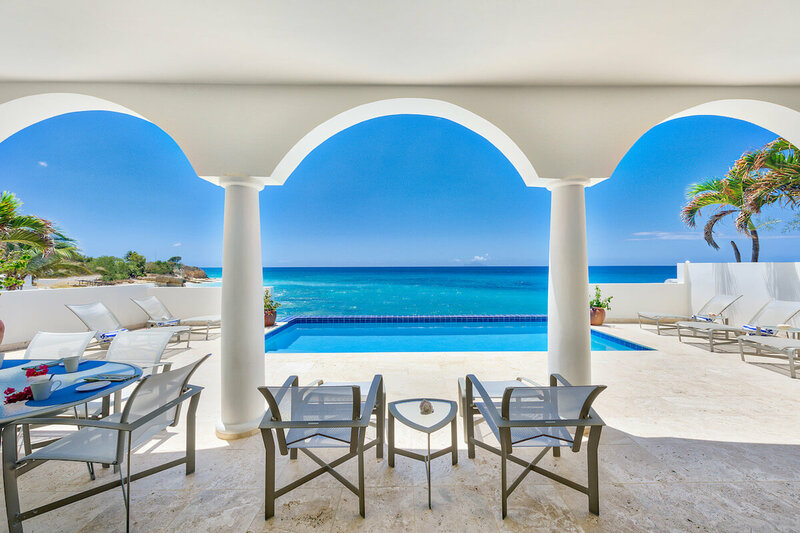 Constructed of reinforced concrete and finished in natural materials, each Shore Pointe Villa is as welcoming and carefree as the Caribbean itself. We do not guarantee the internet connection. The owners or Wheretostay.com cannot be held responsible if is not working properly. In case the wireless connection is not working, a dial-up connection for $95 and 50 hours connection can be provided. Also, the beach in front of the Shore Pointe Villas where this property is located can be completely rocky from time to time due to the weather conditions or after a sea storm, and beach quality cannot be guaranteed. If it is too rocky, you may access the beach of Cupecoy from another entrance, and Mullet Bay beach is located less than 1 kilometer away from the villa. 9-foot and 10-foot high ceilings, open-plan layout, handcrafted wood and glass sliding doors opening to covered outdoor terraces, upscale kitchen with custom cabinets, custom countertops and stainless appliances, baths with custom features and stone showers, travertine stone floors throughout, state-of-the-art wiring for electronics, 24/7 security, private garage and dedicated parking, fully landscaped grounds, cisterns and generators, public utilities.